Another round of mutton in soup (Indian Mutton Meatball Soup)? Yes. Obviously right? Why, are you asking me? Honestly, I myself don't have the answer. I just felt like. 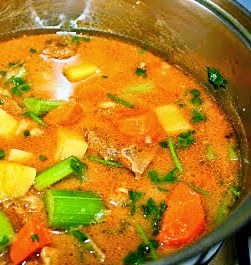 I just wanted to make an Indian style mutton soup (Mutton Parathal, Indian Crab Soup & Crab Curry) and when we speak about Indian style mutton soup on the whole, it must be spices and all things nice, and, also some vegetables swimming alongside tender mutton? Conclusively. Basically, like a curried version (Home Made Curry Mee) and the better the taste once you make a day or two days ahead prior to warming up, even the balance for another meal. Mutton Soup/Sup Kambing! 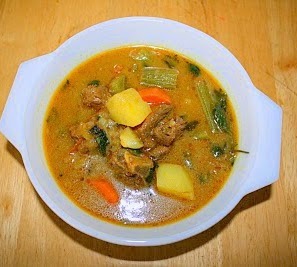 The Indian pride to a delicious hearty mutton soup. Set aside in the fridge for at least an hour. In a heated pot, pour oil. Add spices, onion and mutton. Now, add tomatoes and stir. Pour 1 liter of water, stir, close with a lid and simmer over low heat. Open lid, add potatoes, carrots, coriander powder, cumin powder, fennel powder, black pepper powder and curry powder. Stir, simmer till carrots and potatoes becomes tender. Add celery and simmer for another 3-4 mins. Looks tempting & spicy ,goes well with chapathi & rice.